NutriSystem (NTRI) Still A Candidate For A Buy? Enterprise value and the market capitalization was high during 2007 and 2009. Enterprise value had an erratic movement from 2007 to the trailing twelve months (ttm6). The total debt represents 2 percent of the enterprise value, while cash represents 9 percent thus making the enterprise value lower than the market value. The stock value of NutriSystem Inc. dropped down from 2010 to 2012 ttm6 by 39, 39 and 19 percent, respectively. The buying price for the entire company would be $253 at $9.37 per share for ttm6. For the recent updates in market value, buying the entire business would cost $243 at $9 per share for 2012 ttm8. The investor would be paying 100 percent of NTRI’s because cash and cash equivalent are greater than the total debt. Using Benjamin Graham’s Net Current Asset Value Method, it shows that the stock of NutriSystem Inc. was overvalued from 2007 to the 2012 trailing twelve months. Therefore, the stocks did not pass the stock test because 66 percent of NCAVPS was lesser than the market and enterprise value. In other words, the stocks are selling above the liquidation value of NTRI. The stock price of NTRI was considered expensive and is not a candidate for buying but the stock calls for selling because the market value was 1051 percent above the liquidation value. The MC/NCAV valuation tells us that the stock price of NutriSystem Inc. was trading at the undervalued price because the ratio did not exceed the 1.2 from 2007 to 2012 ttm6. Therefore, the price is considered cheap. The average margin of safety was 38 percent during its 6 years operation. It tells us that buying the stocks of NTRI at the current date, 2012 ttm6 is not recommended because theremarginsero margin of safety. 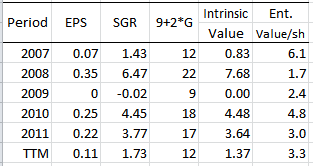 As we can see in the table above, the intrinsic value was negative in 2011 and 2012 ttm6. This is due to negative sustainable growth rate and annual growth rate. If you walk with me further, you will find out why is the growth negative but before that, let us see first the intrinsic value and how it is calculated. The table below will guide us along the intrinsic value and the trend from its 5 years of operation. EPS the company’s last 12-month earnings per share. 2 : the average yield of high-grade corporate bonds. 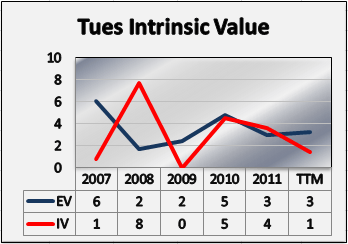 The trend in the intrinsic value was erratic but overall it was dropping from 2007 to 2012 ttm6. Intrinsic value was negative during 2011 and 2012 ttm6, due to the negative sustainable growth rate (SGR), thus giving us a negative annual growth rate. The root of this is, NutriSystem Inc. paid a cash dividend to its investors greater than the return on equity during these periods. The dividend payout ratio was greater by 895 and 8760 percent in 2011 and 2012 ttm6, respectively than the return on equity (ROE). SGR shows how fast a company can grow using internally generated assets without issuing additional debt or equity. The sustainable growth rate for NTRI was erratic from 2007 to 2012 ttm6. 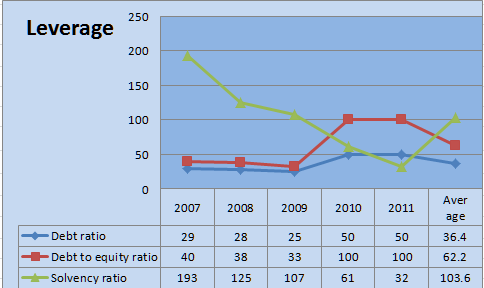 It showed that the payout ratio from 2009 to 2012 ttm6 was higher than the return on equity. During 2011 and 2012 ttm6, NTRI paid a cash dividend higher than its net income, thus resulted to negative SGR as well as its annual growth during these periods. Return on equity (ROE) is an indicator of company’s profitability by measuring how much profit the company generates with the money invested by common stock owners. Below is the formula to use. I will show you the relationship of intrinsic value or the true stock price for NTRI. The Intrinsic Value Graph below will make you fully understand. The true value or the intrinsic value line was far above the enterprise value line in 2007, then a sudden fall at $374 at -82 percent. The falling line continues up to 2012 ttm6 and the intrinsic value was constant at -5 in 2011 and 2012 ttm6. The price remains constant between $9 and $30 from 2007 to 2012 ttm6. 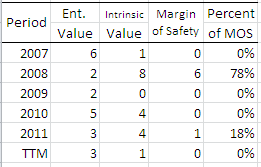 As we can see in the table, using the average ratio, the return on equity and the intrinsic value was higher than in using the relative ratio. While the sustainable growth rate (SGR), annual growth rate and the margin of safety had a higher result than in using the average ratio. In overall view for NTRI, using the relative ratio is favorable because it has a higher result for MOS and growth. 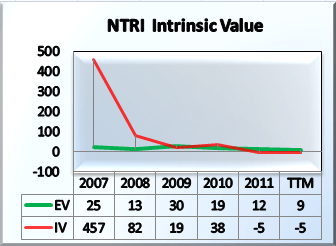 Using P/E*EPS ratio for NTRI, the result showed that stock was trading at the undervalued price from 2007 to 2012 ttm6 because the enterprise value per share was lesser than the P/E*EPS result. Thus, it indicates that the price was cheap. Let me show you if by using the average price to earning ratio will produce a more favorable result for NTRI. 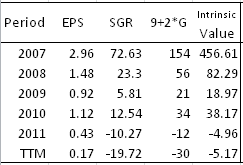 The price to earnings, the relative ratio was greater than average price to earnings, while the result for P/E*EPS, the average ratio has the greater result. The enterprise value represented 18 percent while the P/E*EPS results represented 19 percent average using the relative ratio. While on the other hand, using average price to earnings, EV represents 18 percent and the P/E*EPS represents 23 percent, thus, the price is lesser than the P/E*EPS result, meaning the price was cheap. The price represents 162 percent average and the earnings represent -270 percent average, the enterprise value is 100 percent. The earnings were negative because, in 2009, 2010 and 2012 ttm6, the net earnings are lesser than the number of shares outstanding. The net earnings of NTRI decreased almost tripled down in 2011 and 2012 ttm6, so the downfall was high. As to overview, it tells us that the stock of NTRI was trading at overvalued price because the price was more than 100 percent, therefore, the price was expensive. Enterprise Value (EV)/ Earnings Before Interest, Tax, Depreciation and Amortization (EBITDA) or (EV/EBITDA). The EV/EBITDA was 0.32, in other words, buying the entire business. An investor will wait only a quarter of a year to cover the cost of buying NTRI. Or it means it will only take no more than one year of the earnings of the company to cover the cost. This valuation can also be a measure of the financial health of the company because it factors the accrued accounts. One valuation is not enough to gauge the stock of a company. That is why in this valuation, there are at least 5 evaluations. Overall, the price was expensive therefore I recommend a HOLD on the stocks of NutriSystem Inc.
NutriSystem Inc. (NTRI) is a provider of weight management products and services. To know where the company is leading to when it comes to financial status, thus we begin by analyzing their financial statement in this value investing guide. When we speak of liquidity, we pertain to the ability of a certain company to pay its short-term debt obligations. If that’s the case, what would it be for Nutrisystem Inc.? Let us have a look at the table below. Financial liquidity of NTRI showed their ability to pay its short-term debt obligations. As we can see in the table above, the current ratio is the result of dividing current assets by current liabilities wherein the trend of first three years increased then decreased down to 2.85 percent in 2010 and 2011 with average five years of 3.0. The quick ratio, on the other hand, is the result of dividing quick asset (current asset minus inventory) over current liabilities. It showed the same trend as a current ratio but average of 1.91 percent was lesser. The company’s net working capital ratio or the result of working capital over total asset depicted an inconsistent up and down trend with an average of 52.4 percent. The overall financial liquidity of NutriSystem Inc. depicts that the company is financially healthy. There have enough funds to settle obligations and creditors. Even net working capital ratio dipped down to 4.09 percent and 18.9 in 2008 and 2010 due to the financial crisis, they were still able to recover in 2009 and 2011. This means that they have sufficient working capital. NTRI has a high receivable turnover ratio averaging 40.5 times implies either that a company operates on a cash basis or that its extension of credit and collection of accounts receivable was efficient and remarkable. Its inventory levels of 8 times trailing twelve months indicate better performance and efficiency in controlling their inventory. But sometimes a high turnover may result in loss of revenue due to inventory shortage. Payable turnover average 6 to 7 times a year means the company pays off their suppliers. This means they have an average of almost two months credit from their supplies. Fixed asset turnover and asset turnover were trending down which means lower ratios. Thus, they are not generating more revenues from their investments of fixed assets and assets as a whole. The receivable turnover ratio is the number of times accounts receivable is collected throughout the year. Wherein it showed a declining trend in 2008 and 2009 but eventually increased in 2010 and 2011, leaving an average of 40.5 times. This is considered, definitely, a high receivable turnover. Inventory turnover ratio shows how many times a company’s inventory is sold and replaced over a period. This depicted an increasing trend with a slight decrease in 2009, maybe this is due to the economic crisis in the US. But it increased again in 2010 and 2011 with a good trailing twelve months of 8 times. Likewise, payable turnover ratio shows investors how many times per period the company pays its average payable amount.In the case of NutriSystem Inc., it increased to 8 times in 2008 but went down 6 times in 2011 with 7 times in trailing twelve months. The fixed-asset turnover ratio measures a company’s ability to generate net sales from fixed-asset investments – specifically property, plant and equipment (PP&E) – net of depreciation. This showed a decreasing trend yearly with only 13 trailing twelve months. So, a lower fixed-asset turnover ratio means that the company has not been effective in using the investment in fixed assets to generate more revenues. Asset turnover ratio is a number of sales generated for every dollar’s worth of assets. This showed a high volume but a decreasing trend yearly for NutriSystem. This meant a lower amount of sales generated for every dollar of total assets. Receivable conversion period measures the number of days it takes a company to collect its credit accounts from its customers. 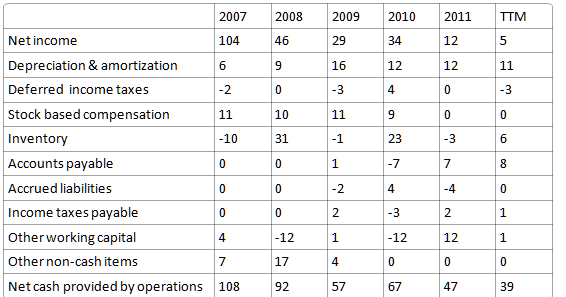 Nutrisystem Inc. had an increasing trend from 2007 to 2009 of 8 to 10 days but sadly decreased in 2010 to 8 and 9 in 2011. But overall a lower number of days is better because this means that the company gets its money more quickly. The days’ sales in inventory or inventory conversion period tell the business owner how many days on an average it takes to sell inventory. With the company, it showed a declining trend yearly and trailing twelve months of 45 days. The usual rule is that the lower, the better since it is better to have inventory sell quickly than to have it sit on the shelves. While payable conversion period measures how the company pays its suppliers in relation to the sales volume being transacted. This showed an increasing trend of almost 54 days and 51 trailing twelve months for the company to pay its suppliers. Cash conversion cycle validates the effectiveness of the company’s resources in generating cash. Wherein it shows an increasing trend in 2008 of 39. 8 but decreases down in 2009 to 2011 of 10.5 days. Debt ratio indicates what proportion of debt a company has in relation to its assets. Wherein from 2007 to 2009, it has been slightly decreasing but in 2010 to 2011 it abruptly increased to 50 percent and it had an average of 36.4 percent. This indicates that Nutrisystem Inc. has more assets than debt. Debt to equity ratio is a measure of the relationship between the capital contributed by creditors and the capital contributed by shareholders. This showed a decreasing trend for NutriSystem Inc except in 2010 and 2011 wherein it increased to 100 percent. This means that the company has a high debt/equity ratio and have been aggressive in financing their growth with debt. Solvency ratio determines how well the company is able to meet its debts as well as obligations, both long-term and short-term. The trend depicts a decreasing ratio year after year but has an average of 103.6 percent. By looking into their debt ratio, we can get the idea about the leverage of NutriSystem Inc. along with the potential risks they are facing in terms of its debt load. In 2011 they have more assets than debts. Debt to equity ratio showed that a 100 percent means that the debt equal to equity or a lot of debt was used to finance and increased operations. So, Nutrisystem, Inc. could generate more revenues than it would have without outside financing. But the cost of this debt financing may outweigh the gain that they generate on the debt through investment and business activities. Eventually, this can lead to bankruptcy if not handled properly by their management and leave nothing to shareholders. As per solvency ratio provides a measurement of how likely a company will be able to continue meeting its debt obligations. Wherein Nutrisystem, Inc. started as a very high solvent company but it went trend down to 32 percent in 2011. And generally speaking, the lower a company’s solvency ratio, the greater the probability that the company will default on its debt obligations. But this varies from industry to industry. As a general rule of the thumb, a solvency ratio of greater than 20 percent is still considered financially healthy. Current liabilities to total assets identifies how much will be claimed by the creditor against total assets which declined for the first three years and increased slightly in 2010 of 14 percent and 2.25 with an average of 26.38. While long-term debt to total assets is to make out how many claims the banks have or the bondholder against its total assets. This show an increasing trend, and visibly that in 2010 and 2011 it has a long-term debt of 23.3 percent against its total assets. Then, stockholders equity to total assets is to know how much the owner can claim in its total assets which showed a good portion of the total asset for the first three years and went down in 2010 and 2011 to 50 percent due to the long-term debt share. Based in NutriSystem Inc. a total five years of operation the majority in control of their total asset is their stockholders at 63.96 percent than their creditors of 26.38 and last to their bank/bondholder at 9.78 percent average. For the first three years stockholders maintained a high ratio but because of the long-term debt acquired in 2010 and 2011, it shared with their total assets that lower the portion of shareholders. Gross plant, property, and equipment is the gross total of fixed assets cost, this showed a trend that was increasing yearly for the last five years. It had a growth ratio of 32 percent, 2.4, 40, and 10 with an average of 47.6 million dollars. Accumulated depreciation is to reduce the carrying value of an assets to reflect the loss of value due to wear, tear and usage. Wherein it also shows a yearly increasing trend with an average of 21.2 million dollars which is 44.5 percent of the average cost of plant, property, and equipment. Net plant, property, and equipment is the result after deducting the accumulated depreciation from gross PPE, this showed a decrease in 2009 but it increased back in 2010 and 2011. It had an average of 26.4 million dollars which is 55.4 percent of the average cost. An income statement allows the business as well as investors to understand if the company is operating efficiently and successfully. Their net margins, the after-tax the profit a company generated for each dollar of sales, showed a downward trend and has a growth ratio of -49.8 percent, -18.8, 20.8, -53.6 and trailing twelve months of 1.12. Their asset turnover which measures the effectiveness of the company to convert its assets into revenues likewise showed a decreasing trend and has a growth ratio of -2 percent, -17, -0.63, -16 and trailing twelve months of 2.70. The return on assets tells us how much profit the company generated for each dollar of total assets. It decreased from 2007 to 2009 of -50.8, -32.5 but the increase of 20.3 percent in 2010 and abruptly drops again in 2011 of -61 percent. This tells us that they tried to recover in 2010 but earnings went down in 2011 causing lesser returns from assets. Their return on equity the company could return such profit percent for every dollar of equity. For the past three years, it has been moving down it recovered 40 percent growth in 2010 but still, it went down 50.4 percent in 2011. Their return on invested capital, this is the financial measure that quantifies how well a company generates cash flow relative to the capital it has invested in its business. Almost the same with return on equity except that in 2011 it declined more of 64.5 percent. The company’s financial leverage this measures the financial structure ratio of the company base on total assets against total stockholders equity. This shows a decreasing trend for the first three years but it abruptly increases in 2010 and 2011 with a trailing twelve months of 2.14. NutriSystem Inc.’s profitability trend does not look good especially when it declined in the first three years and current year. Its asset turnover ratio tends to be inversely related to their net profit margin, wherein the higher the net profit margin the lower the asset turnover. This means that they earn more from revenue than converting assets to revenue. The investors can compare companies using this to determine which one is the most attractive business. Their return on assets depicted unsatisfactory earnings for every dollar of total assets due to their net income and total assets growth ratio yearly which was on a downward trend but somehow managed to increase in 2010 and abruptly declined again in 2011. In terms of their returns using the DuPont Model; wherein an equity multiplier is used to measure their financial leverage allowing investors to see what portion of the return on equity was the result of debt; it also declined but abruptly increased back in 2010 to 2011 due to the acquired long-term debt of 35 million dollars. Even if their return on equity showed a high favorable decreasing trend due to the financial crisis in the US, sales went down so as their earnings. The bulk of the return comes from profit margins and sales. Likewise, cash flow earned from the invested capital because of the crises also plays unsteadily. So, overall profitability was not quite impressive. This shows how much money NutriSystem Inc. had brought in for the last five years in million dollars. Revenue means how much money a company has generated in terms of “sales”, representing the amount of money a company brings in for selling its goods and services. This shows that Nutrisystem Inc. sales trend went down with a growth ratio of -11.5 percent, -23.3, -3.4, -21.4 and trailing twelve months of 406 million dollars. Gross profit shows how much of their markup a company receives on the goods and services it sells after deducting its cost of revenue wherein it also depicted a decreasing trend. Operating profit is the best indicator of a company’s true performance in their operations.This is the result of deducting all the expenses incurred in their operations, wherein it showed a downhill trend of -44.7 percent, -52.2, 23.3, and -64. It recovered in 2010 but still abruptly decreased again in 2011. Income shows that Nutrisystem Inc. experienced a marketing problem causing sales to go down, aside from the US financial crises. They recovered substantially in 2010 but in 2011 they cut off almost 50 percent of their operations. Thus, net income amounts, like a domino effect, became smaller. The table below showed how much NutriSystem Inc. spent (in million dollars) over the last five years of their operation. The cost of revenue was the amount NutriSystem Inc. paid for the goods that were sold during the year. This showed a declining trend and growth ratio of -6.8 percent, -28, -7.8, and -12. Operating expense was the expenses incurred in conducting the company’s regular operations of the business. This depicted an up and decreasing trend with the growth ratio of 3.6 percent, -6.9, -4.1 and -20.3. Other income and expense were the non-operating income and expenses from their business. This reflected the income and expense in 2007 to 2009 only. Provision for income tax was the amount allocated for their payment of income taxes. This shows a growth ratio of -44.2 percent, -67.6, 72.7 and -68.4. Nutrisystem Inc.’s margin tells us the total performance of their business operations. It showed a good profit margin of at least more than 50 percent, unfavorable declining operating margin with the ratio below 30 percent and lastly, a net margin of less than 10 percent. This means operations are in a bad shape to have margins below our scaling standards. Their gross margin indicates the percentage of revenue dollars available for expenses and profit after the cost of merchandise is deducted from revenues. And this averages 52.86 percent. And their operating margin is the operating income expressed as a percentage of sales or revenue after deducting the operating expenses from gross profit. Which has an average of 11.5 percent? While the net margin is the net income expressed as a percentage of sales or revenue after deducting provision for income tax from income before tax. And it has a 7 percent average only. 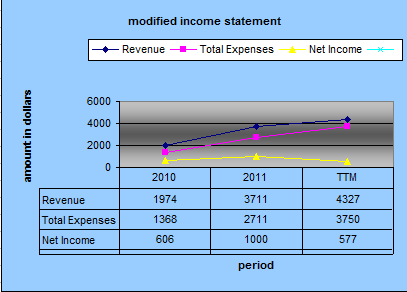 Above graph presents us the modified income statement of Nutrisystem Inc. The movement was all decreasing from 2007 to 2011. This tells us that sales of their products diminished so as its cost or expenses, leaving a merger net income yearly. Overall operations were affected by the lower sales and problem in marketing their products. Cash flow statement helps us determine if Nutrisystem Inc. has an available cash for the operation or if they have a good free cash flow and excess of funds to refinance operations for business expansion. Nutrisystem Inc. had sufficient cash flow provided from operating activities but it seems to be declining down yearly except for 2010 favorable increase. This tells us that they are having problems on their sales, not in their operations. But eventually, operations inventory and payables will be affected if sales of products slow down. Their net income showed a diminishing trend and growth ratio of -55.7 percent, -36.9, 17.2, -64.7 with trailing twelve months of 5 million dollars and only in 2010 it recovered to have a positive growth. Its depreciation and amortization increased for the first three years but eventually settled to 12 million dollars in 2010 and 2011. 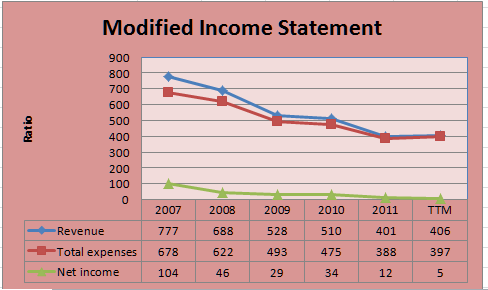 Deferred income taxes showed the negative difference of -2 and -3 in 2007 and 2009 with a positive 4 in 2010. As noted, Nutrisystem Inc. paid their workers or employees with stock for compensation. Their inventory trends look unstable with up and down differences every year. Accounts payable, accrued liabilities and income taxes payable seems to have differed only in 2009 to 2011. Other working capitals have the balance of -12 in 2008 and 2010 the rest have positive amounts of 4, 1 and 12. And other non-cash items showed balances only in 2007 to 2009 with no amounts for 2010 and 2011. Thus, overall they had a net cash flow from operations which started good but in decreasing trend except in 2010 with a trailing twelve months of 39 million dollars. Net cash used for investing activities was used in investments in PPE, purchases of investments, sale/maturities of investments and other investing activities. This means Nutrisystem, Inc. has used funds wisely into their investing activities amounting favorably good to the sale in 2007, 2010 and 2011. Their investments in plant, property, and equipment showed negative amounts with a growth ratio of -36.8 percent, -33.3, 1.5 and -60 with trailing twelve months of -10 million dollars. In 2008 they had a PPE reductions of 1 with a net acquisition of -6. They had purchases of investments in 2007 amounting -193, 2009 of -30, 2010 of -1 and -10 in 2011 with trailing twelve months of -19. They also had sale/maturities of investments in 2007 of 243, 2008 of 2, in 2010 and 2011 of 10 and 21 respectively. With other investing activities, the company had 2 in 2007. Therefore, net cash used in investing activities had an up and down trend yearly, with positive differences in 2007 of 33 and in 2011 of 3, with negative amounts of -14, -39 and -10 in 2008 to 2009 respectively. The cash flow from financing activities was provided by debt issued through long-term debt in 2010 and 2011 amount 30 million dollars each. NTRI’s cash provided by common stocks issued of 2 and 1, and other financing activities of 6 and 2 in 2007 and 2008. Moreover, they used cash from financing activities to pay debt repayments in 2011 of 30 million dollars and common stocks repurchased from 2007 to 2010. They also paid dividends from 2008 to 2011 and other financing activities from 2009 to 2011 with trailing twelve months of -20 and -4. Therefore, net cash flow from financing activities has a declining trend with growth ratios of -29.8 percent, -68.8, 176, -67 with trailing twelve months of -23. As we can see NTRI borrowed money only in 2010 and 2011 and even paid half in 2011. The bulk of cash flow was used in the repurchased of common stock, dividend payments, and other financing activities. Thus accounts for the balance of cash flow from financing. To get if the company have the free cash flow to be used in operations and expansions, we deduct from operating cash flow a number of capital expenditures. Therefore, we can say that NutriSystem Inc. has sufficient free cash flow but in a decreasing trend yearly with the growth ratio of -10 percent, -39.5, -4, and -17 and trailing twelve months of 28 million dollars. The overall cash flow of NTRI. showed that in 2007 and 2011 they have a positive amounts 28 and 27 million dollars respectively, with negative amounts in 2008 to 2010. This means that the company’s cash flow from operations in 2008 to 2010 was not enough after deducting the investing and financing activities. This may be due to the US financial crisis and decreases in sales of their products. Thus, the cash at the end of each period after deducting the net change in cash from cash at the beginning of period likewise decreased. 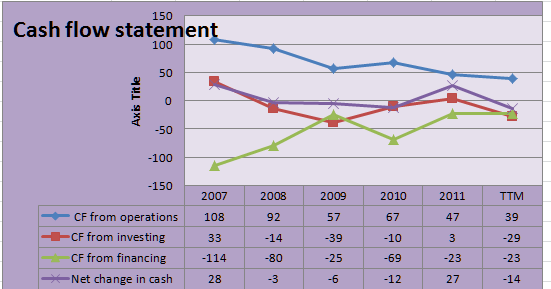 The graph shows cash from operations, investments and financing and the result net change in cash. This depicts a five-year period and the flow from operations appears to slowly go down year after year. Investing activities declined from the first three years and went up in 2010 and 2011. While the company’s financing activities went up in their first three years, then down in 2010 and up again in 2011. Net change in cash started good but the succeeding three years it went down and up again in 2011. Operating cash flow to sales ratio measures how much cash generated from its revenue for the period and gives investors an idea of the company’s ability to turn sales into cash. It showed a slight decreased in 2008, a dip in 2009 of -19.4 percent, increase of 21.3 in 2010 and abrupt decrease again in 2011 of -10.6 with trailing twelve months of 9.6 percent. Operating cash flow ratio measures how much cash left after considering short debt by using the result of operating cash flow from operations over current liabilities. This shows a good liquidity in terms of using cash flow as opposed to income which is sometimes a better gauge. Herein it indicates an up and down trend increase in 2008 of 13.6 percent, decrease in 2009 of -34.9, increase in 2010 of 17.5 and decreases down in 2011 of -31.6 for NTRI. Free cash ratio helps us conclude if the company will grow in the future. Through the result of operating cash flow, less dividend paid less capital expenditure over operating cash flow. It shows sufficiently the company has free cash flow. Even if the trend is declining down yearly, in 2011 it increases 47.9 percent and trailing twelve months to 23 percent. Cash flow over capital expenditure for the period. This shows an up and down trend with 3.90 trailing twelve months. So, the company has the financial ability to invest in itself through capital expenditures (CAPEX), then it is thought that the company will grow. 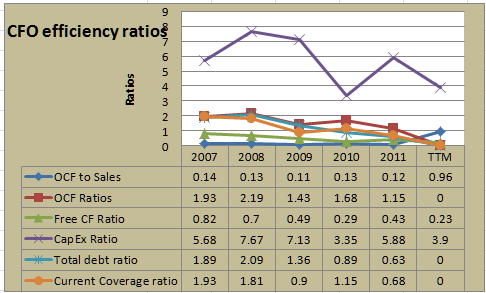 Total debt ratio measures company efficiency, the result of operating cash flow over total liabilities. Wherein it shows that Nutrisystem, Inc. has a good total debt ratio the first three years but in 2010 and 2011 it decreases down to 0.89 and 0.63 due to the long-term debt they acquired. And this means operating cash flow will not be sufficient the last. Current coverage ratio measures how much cash available after paying all its current debt. It is determined by cash flow from operating less dividend over current liabilities. It resulted in a decreasing trend except in 2010 and had a growth ratio of -6.2 percent, -50.3, 27.8, and -40.8. This means that after paying off dividends their operating cash flow is no longer enough to pay their current obligation in 2009 and 2011. Working capital in dollars was 1,857, 3,705 and 10,933. The company’s working capital was extremely high and continuously increasing by 99.5 percent and 195 percent respectively. After getting the results, the question would be “Does the company has sufficient resources to stay in business in the short term?” According to Rio, Facebook Inc. has enough and sufficient resources to stay in business in the short term as proven by its liquidity ratios. They showed extremely high current resources against current liabilities particularly cash account which contributed 85 percent of its total current asset. The company is very liquid and capable to settle all its obligations and can even invest additional product lines. The receivable turnover ratio was 5 and 7 for the two years period, while its payable turnover ratio was 68 and 59 and fixed asset turnover ratio was 3 and 3. The company showed very impressive returns on its investments. Thus, it has the capability to continue its business operation. Company leverage relates to how much debt it has on its balance sheet and at the same time, measure of financial health. In every business, it is important to know the ratio of its total obligations versus total resources of the company. Debt to equity ratio will show us a better idea of the company’s financial condition along with its operational efficiency. A company with a high proportion of long term debt is said to be high leverage. Somehow, long term liabilities are risky because if bondholders/banks are not paid promptly, they can take legal action to obtain payment, such action in extreme cases, force the company into bankruptcy. And solvency ratio was 0.90, 0.92 and 0.63. This tells us that the company was able to settle all obligations upon due date. The above table presented that as of June 2012, current liabilities to total assets was .80 which means that the creditors have 80 percent claims on the total assets of the Facebook, while the ratio of stockholders equity to total assets was .89 which also tells us that 89 percent of the company’s assets belong to the owners of the company. Therefore, the owners or stockholders have the majority control of FB. Net book value of PPE was $2,105 which is equivalent to 77 percent of the total cost. 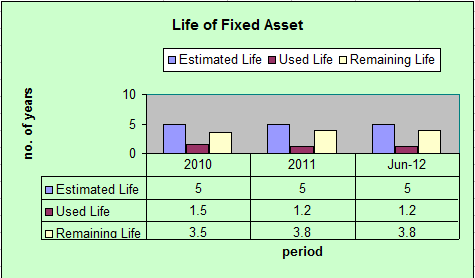 Using an estimated useful life of the property of 5 years, deducting its used life of 1.2 years as of June 2012, the remaining life of the PPE was 3.8 years. Therefore, Facebook Inc.’s investment in PPE will last for more than 3 ½ years before it is fully depreciated. Net margin of the company was .31 and .27 with TTM of .13 which shows that it declined in 2011 by 4 percent. Asset turnover was .66 and .59. TTM of .29. It is computed as revenue over the total asset, where asset turnover tells an investor the total sales for each $1 of assets. Return on asset was .34 and .27 which tells us how much profit a company generated for each $1 in assets. Return on equity was .47 and .35. , tells us how much profit FB earned in comparison to the total amount of shareholder equity on the balance sheet. Financial leverage or equity multiplier was 1.38 and 1.29, computed as assets over total stockholders’ equity. Return on invested capital was .43 and .36. This is the financial measure that quantifies how well a company generates cash flow relative to the capital it has invested in its business. Profitability ratios of FB show a high level in 2010 but slightly decline in 2011 because of the increase in operating expenses which doubled the previous year.Although its revenue also increased, it could not cope up with the high expenses. It is compared to a domino effect; once one is affected, it affects all. Revenue in million dollars was 1,974 and 3,711. TTM of 4,327. It shows a growth rate of 88 percent in 2011, while TTM is 16 percent. Gross profit was 1,481 and 2,851. TTM of 3,237 which was 75, 77 and 75 percent of revenue. This was company’s income after deducting its cost of revenue. Operating income was 1,032 or52 percent to revenue and 1,756, which is 47 percent to revenue. TTM was 3,188 or equivalent to 74 percent of revenue. This was the company’s income after deducting all operating expenses. Income before taxes was 1,008 and 1,695. TTM of 515. In percent, it was 51 and 46 of revenue and this was the income after interest and other income and expenses. Net income was 606 and 1,000 with TTM of 577. It was the company’s income after deducting income taxes, with a growth of 65 percent in 2011. It is equivalent to 31 and 27 percent of the company’s revenue. Facebook Inc.’s total revenue showed a growth rate of 88 percent in 2011 compared to its earnings in 2010, with a gross profit rate ranging from 75 to 77 percent. Its operating income was 52 percent in 2010 and 47 percent in 2011 while the company’s net income was 31 and 27 percent of total revenue. Considering these results, the company is doing well in its operation. Looking into their expenses, we would be able to know how much the company spent in their operations for two years from 2010 to 2011. The cost of revenue in dollars was 493 and 860, TTM of $1,090. This represented 25 and 23 percent of total revenue. The cost of 2010 was almost doubled in 2011, its increase was 43 percent since its sales also increased. Sales, the general and administrative expense was 449 and 1,095, which was equivalent to 23 and 30 percent of revenue. It abruptly rose to 144 percent in 2011. Provision for income tax was 402 and 695 with TTM of -62. This ranges from 19 to 20 percent of revenue while TTM was -1 percent. The company’s revenue showed a high growth of 88 percent in 2011; a good sign of a starting business, while the cost of revenue was 25 and 23 percent. After deducting the cost of revenue, its gross profit ranges from 75 to 77 percent. The company’s operating expenses were 23 and 30 percent of revenue, its operating income showed a decrease from 2010 to 2011 by 5 percent due to an increase in operating expenses. And net income was 31 and 27 percent of revenue. The profit margin had declined by 4 percent in 2011 affected by the increase in operating expenses. The company’s net income was $606 and 1000. TTM of 577. It shows that the net income in 2011 rose by 65 percent against 2010. Its depreciation and depletion were $139 and 323. TTM of 449 which showed that it increased in 2011 by 132 percent because of additional investment in property, plant, and equipment. Other Working Capital was $145 and 166. with TTM of -542. It expanded in 2011 by 14 percent. Accrued liabilities was $20 and 38. TTM of 285. Cash flow from operating activities was $698 and 1549. TTM of 1758. It shows us that it doubled in 2011 with a growth rate of 122 percent. Cash flow from operating activities shows a high balance in 2010 as well as 2011, the amount was more than doubled in 2011. It shows that the company was doing well in their two years of operation. Investment in property, plant and equipment was -293 and -606. TTM is -1187. Facebook expanded in 2011 in PPE by 107 percent. Its acquisition, net was -22 and -24, with TTM of -595. The company increased its acquisition in 2011 by 9 percent only. Sales/maturity of investment was 629. TTM was 1,863. Other investing activities were -9 and 6. TTM of 6. Net cash used for investing was -324 and -3,023. TTM of -8,008. The bulk of investment in Facebook Inc. was in 2011 wherein property, plant and equipment were 107 percent against 2010 and purchase of investment of $3,023. The above table shows that Facebook incurred a negative balance on investing cash flow because of its expansion through investments in which its cash outflow exceeds cash inflow. Debt repayment was -90 and -181. TTM of 8, which shows that it doubled in 2011. Common stock issued was 500 and 998. TTM of 6761. It shows that in 2011 stock issued was increased by 99 percent. Other financing activities were 371 and 381. TTM of 440. So, its net cash provided by financing was 781 and 1198, which showed a positive balance. It means that cash came in was greater than cash out. It further increased in 2011 by 53 percent. Based on the above table, Facebook Inc. had money left for its financing activities. The company generated cash through the issuance of common stocks which was $500 in 2010 and increased to $998 in 2011 and Also, also through other financing activities. While cash out was in repayment of debt with minimal amount involved. 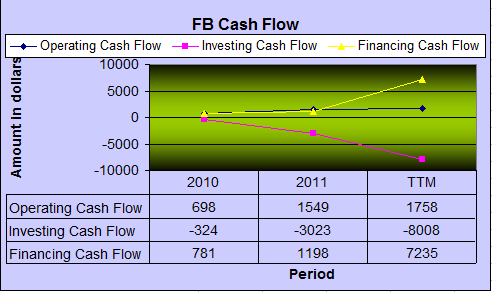 Free cash flow of Facebook was 405 and 943. TTM of 571. It shows that it doubled its amount in 2011 compared to 2010. This means that the company has money left over after paying its expenses and dividends. Operating cash flow to sales was .35 and .42. It is the proportion of the cash flow provided for the operation to its revenue. There was an increase of 7 percent in 2011. Operating cash flow ratio and current coverage ratio was .31 and .34. It measures how liquid a firm is in the short run since it relates to current debt and cash flows from operations. Free cash flow ratio .58 and .61. A measure of financial performance calculated as operating cash flow minus capital expenditures. It shows that it is above 50 percent and progressing by 3 percent. Capital expenditure ratio was 2.38 and 2.56, which provides information on how much of the cash generated from operations will be left after payment of capital expenditure to service the company’s debt. If the ratio is 2, it indicates that the company generates two times what it will need to reinvest in the business to keep operations going; the excess could be allocated to service the debt. Total debt ratio was .84 and 1.08, which shows the percentage of operating cash flow against its total liabilities. This ratio provides an indication of a company’s ability to cover total debt with its yearly cash flow from operations. The higher the percentage ratio, the better the company’s ability to carry its total debt. Cash flow ratios of Facebook against revenue, capital expenditure, free cash flow, current and total liabilities showed an impressive result. These are progressing in the succeeding months by having an increase which tells us that Facebook is doing very well in its business. It is worth investing in this kind of company as far as its financials are concerned. Value Investing Guide on Facebook Inc. The receivable turnover ratio was 5 and 7 for the two years period, while its payable turnover ratio was 68 and 59 and the fixed asset turnover ratio was 3 and 3. The company showed very impressive returns on its investments. Thus, it has the capability to continue its business operation. 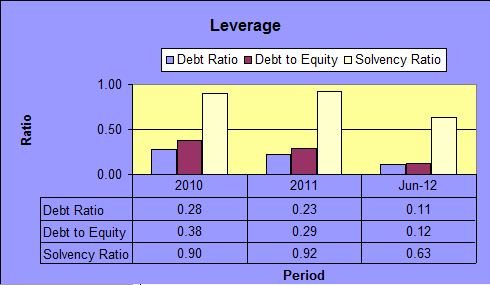 Company leverage relates to how much debt it has on its balance sheet and at the same time, measure of financial health. In every business, it is important to know the ratio of its total obligations versus the total resources of the company. Debt to equity ratio will show us a better idea of the company’s financial condition along with its operational efficiency. A company with a high proportion of long term debt is said to be high leverage. Somehow, long term liabilities are risky because if bondholders/banks are not paid promptly, they can take legal action to obtain payment, such action in extreme cases, force the company into bankruptcy. Netbook value of PPE was $2,105 which is equivalent to 77 percent of the total cost. Profitability ratios of FB show a high level in 2010 but slightly decline in 2011 because of the increase in operating expenses which doubled the previous year. Although its revenue also increased, it could not cope up with the high expenses. It is compared to a domino effect; once one is affected, it affects all. Gross profit was 1,481 and 2,851. TTM of 3,237 which was 75, 77 and 75 percent of revenue. This was the company’s income after deducting its cost of revenue. Value Investing Approach for Stamps.com Inc. The basis for this valuation is the company’s five years of historical financial records. I calculate first the enterprise value as my first step in valuation. I also apply the relative valuation method by using Price to Earnings (P/E), Earning per Share (EPS), Enterprise Value (EV) and Earning Before Interest + Tax + Depreciation + Amortization (EBITDA). The concept of enterprise value is to calculate what it would cost to purchase an entire business. Enterprise value (EV) factors liabilities and cash. In other words, it measures the value of the productive assets that are used in producing the company’s product or services. The market capitalization is the entire value of the company in the stock exchange. It represents the price of the equity. Total debt, on the other side, represents the sum of short and long term debt. Cash and cash equivalents include short-term investment. The market capitalization of Stamps.com Inc. was erratic, wherein, its lowest was in 2009 at $141 at $9 per share and its highest was in 2011 at $392 at $26.13 per share. The company had no total debt and cash represents 26 percent of the enterprise value. Thus, making the enterprise value lower than the market value. Buying the entire business, the investor would be paying $314 at $19.63 per share. NCAV method tells us that the stock of Stamps was overvalued because it was trading above the company’s liquidation value at 86 percent average from 2007 to 2012 trailing twelve months. Benjamin Graham would not consider buying if the price is trading above 66 percent of net current asset value per share. Therefore, the stocks of Stamps.com Inc. calls for selling. Using this valuation, MC/NCAV indicates that the stocks of Stamps are trading at an overvalued price because the result exceeds 1.2 ratios from 2007 to 2012 trailing twelve months. The ratio represents 223 percent of the net current asset value. Therefore, the price was expensive. 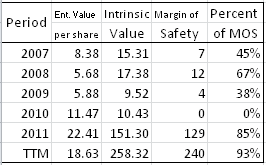 The margin of safety represents 85 percent average of the intrinsic value which exceeded the requirement. Thus, it indicates that the price is cheap from 2007 to 2012 trailing twelve months, except in 2010, where there were zero margins of safety. wherein; EPS: the company’s last 12-month earnings per share. G: the company’s long-term (five years) sustainable growth estimate. Let’s go through the sustainable growth rate for STMP. The rate was 21 percent average, the same with return on equity. ROE and payout ratio are the factors used in calculating SGR. The company is not paying its cash dividends to the investors from 2007 to 2012 trailing twelve months, therefore, there was no payout ratio. The return on equity was lowest in 2009 but managed to increase by 15, 312 and 21 percent in 2010 to 2012 trailing twelve months, respectively. In the trailing twelve months, the ratio was high at 46.15. This was the maximum growth rate that Stamps can sustain without having to increase financial leverage. Return on Equity (ROE) is an indicator of company’s profitability by measuring how much profit the company generates with the money invested by common stock owners. It is also known as Return on Net Worth. We will walk further and I will show you the relationship of price and the true value of the stocks of Stamps. Let us look at this graph below. The relative valuation methods for valuing a stock, are used to compare market values of the stock with the fundamentals (earnings, book value, growth multiples, cash flow, and other metrics) of the stock. This valuation will determine the status of the stock price; whether the stocks are undervalued or overvalued; by multiplying the price to earnings (P/E) ratio with the company’s relative earning per share (EPS) and comparing it to the enterprise value per share. The result for P/E*EPS evaluation showed that stocks of Stamps.com Inc. were trading at an undervalued price from 2007 to 2012 trailing twelve months because the ratio was higher than the enterprise value per share. Enterprise value per share represents 12 percent average while the P/E*EPS represent 15 percent average. Therefore, the price was lower by 20 percent average making it undervalued. The use of this ratio is to separate price and earnings in enterprise value. By dividing the enterprise value to projected earnings (EPS), the result represents the price (P/E) and the difference represents the earnings (EPS). If the analysts think that the appropriate ratio is greater or lower than the result, then the stock is either over or undervalued. The EV/EPS valuation indicates that price was 128 percent, while earnings represent -28 percent. It shows that Stamp was unprofitable because the result for EPS was negative. The percent of earnings was negative 68 average. The earning per share factors the number of shares and net income. If the number of shares is greater than the net income, the result of EPS is below 1.0 ratio, it means, there was no earning per the number of shares, thus resulting to negative EPS with this valuation. This valuation will show us how much dollar an investor is willing to pay for the price and how much for the earnings. It also gives us an idea if the price is expensive or cheap. This indicates that the stock of Stamps.com was expensive because the price represents more than 100 percent. Using the average price to earnings ratio, it showed that it will produce a higher rate than by using the relative price to earnings ratio. Further, it told us that using the relative, the price was 21 percent lower than P/E*EPS ratio, while, using the average ratio, the price was 38 percent lower than P/E*EPS ratio. Furthermore, it indicates an undervalued price from 2007 to 2012 trailing twelve months. This metric is used in estimating business valuation. It compares the value of the company inclusive of debt and other liabilities to the actual cash earnings exclusive of non-cash expenses. This is useful for analyzing and comparing profitability between companies and industries. It gives us an idea of how long it would take the earnings of the company to pay off the price of buying the entire business, including debt. The result of this valuation for Stamps.com showed unfavorable result because buying the entire business, the investor will wait for 21 years average to cover the costs of the purchase price. In other words, it will take 21 times the earnings of the company to cover the cost of buying the entire business in cash. Using this metric, the unprofitability of Stamps.com Inc. was shown. The earning power of the company was very low because EBITDA represented only 6 percent average against enterprise value. It might also indicate that the market value for Stamps.com Inc. was too high based on its earnings. 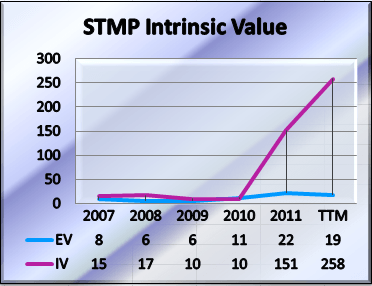 The enterprise value of STMP has an erratic movement from 2007 to 2012 trailing twelve months. The company has no debt and its cash and cash equivalent represent 26 percent of the enterprise value, thus making the enterprise value lower than the market value by 26 percent. Benjamin Graham’s stock test indicates that the stock of STMP. did not pass the test because the ratio is greater than 66 percent of net current asset value. It was greater by 827 percent above the result. While, market value/net current asset (MV/NCAV) valuation shows that the market price was greater than 1.2 ratio., Therefore the stock of STMP did not pass the stock test of Benjamin Graham. Further, using the average method, the annual growth rate, and the sustainable growth rate was 44 and 18 percent, respectively. While the margin of safety was 53 percent average and the intrinsic value was 65 percent. 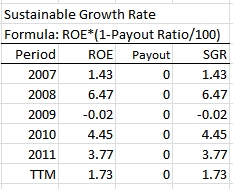 It shows that using the relative return on equity in calculating sustainable growth rate produces a higher rate. 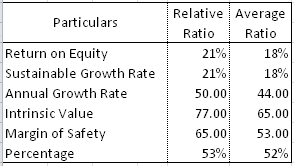 On the other hand, the relative valuation method tells us that in P/E/EPS valuation, the price was undervalued. While the EV/EPS shows that price was 128 percent and the earnings were -28 percent. It indicates that price was overvalued. The EV/EBITDA tells us that buying the entire company, an investor will wait 21 years to cover the buying price. The margin of safety rises up high by 85 and 93 percent in 2011 and 2012 trailing twelve months. In other words, the price was really cheap. Therefore, I recommend a BUY in the stock of Stamps.com Inc (STMP). Stamps (STMP) Investment valuation shows how much growth the company can potentially generate internally without having to increase financial leverage. Stamps.com Inc. (STMP). The basis for this valuation is the company’s five years of historical financial records. I calculate first the enterprise value as my first step in valuation. I also apply the relative valuation method by using Price to Earnings (P/E), Earning per Share (EPS), Enterprise Value (EV) and Earning Before Interest + Tax + Depreciation + Amortization (EBITDA). The concept of enterprise value is to calculate what it would cost to purchase an entire business. Enterprise value (EV) factors liabilities and cash. In other words, it measures the value of the productive assets that are used in producing the company’s product or services. The market capitalization is the entire value of the company in the stock exchange. It represents the price of equity. Total debt, on the other side, represents the sum of short and long term debt. Cash and cash equivalents include short-term investment. NCAV method tells us that the stock of Stamps was overvalued because it was trading above the company’s liquidation value at 86 percent average from 2007 to 2012 trailing twelve months. Benjamin Graham would not consider buying if the price is trading above 66 percent of the net current asset value per share. Therefore, the stocks of Stamps.com Inc. calls for selling. Using this valuation, MC/NCAV indicates that the stocks of Stamps are trading at the overvalued price because the result exceeds 1.2 ratios from 2007 to 2012 trailing twelve months. The ratio represents 223 percent of the net current asset value. Therefore, the price was expensive. The margin of safety is used to identify the difference between company value and price. Value investing is based on the assumption that two values are attached to all companies – the market price and the company’s business value or true value. Graham called it the intrinsic value. The difference between the two values is called the margin of safety. The margin of safety represents an 85 percent average of the intrinsic value which exceeded the requirement. Thus, it indicates that the price is cheap from 2007 to 2012 trailing twelve months, except in 2010, where there was zero margin of safety. Let’s go through the sustainable growth rate for Stamps.com Inc. The rate was 21 percent average, the same with return on equity. ROE and payout ratio are the factors used in calculating SGR. The company is not paying its cash dividends to the investors., thus, there was no payout ratio. The return on equity was lowest in 2009 but managed to increase by 15, 312 and 21 percent in 2010 to 2012 trailing twelve months, respectively. In the trailing twelve months, the ratio was high at 46.15. This was the maximum growth rate that Stamps can sustain without having to increase financial leverage. Return on Equity (ROE) is an indicator of the company’s profitability by measuring how much profit the company generates with the money invested by common stock owners. It is also known as Return on Net Worth. We will walk further and I will show you the relationship between price and the true value of the stocks of STMP. Let us look at this graph below. This valuation will determine the status of the stock price; whether the stocks are undervalued or overvalued. By multiplying the price to earnings (P/E) ratio with the company’s relative earning per share (EPS). And comparing it to the enterprise value per share. The result for P/E*EPS evaluation showed that stocks of Stamps.com Inc. were trading at an undervalued price from 2007 to 2012 trailing twelve months because the ratio was higher than the enterprise value per share. Enterprise value per share represents 12 percent average while the P/E*EPS represent a 15 percent average. Therefore, the price was lower by 20 percent average making it undervalued. The EV/EPS valuation indicates that price was 128 percent, while earnings represent -28 percent. It shows that STMP was unprofitable because the result for EPS was negative. The percent of earnings was negative 68 average. The earning per share factors the number of shares and net income. If the number of shares is greater than the net income, the result of EPS is below 1.0 ratio, it means, there was no earning per the number of shares, thus resulting to negative EPS with this valuation. Using this metric it shows that Stamps.com Inc. was unprofitable. The earning power of the company was very low because EBITDA represented only a 6 percent average against enterprise value. It might also indicate that the market value for Stamps.com Inc. was too high based on its earnings. The enterprise value of Stamps.com Inc. has an erratic movement from 2007 to 2012 trailing twelve months. The company has no debt and its cash and cash equivalent represent 26 percent of the enterprise value. Thus making the enterprise value lower than the market value by 26 percent. Benjamin Graham’s stock test indicates that the stock did not pass the test in NCAV per share valuation. Because the ratio is greater than 66 percent of the net current asset value by 827 percent above the result. 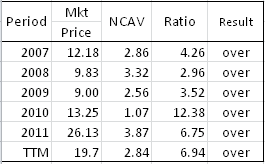 On the other hand, the MV/NCAV valuation shows that the market price was greater than the 1.2 ratios. Therefore the stock of STMP did not pass the stock test of Benjamin Graham. Further, using the average method, the annual growth rate, and the sustainable growth rate was 44 and 18 percent, respectively. While the margin of safety was 53 percent average and the intrinsic value was 65 percent. Relative return on equity in calculating the sustainable growth rate produces a higher rate than using the average method. This valuation tells us that buying the entire company, the investor will wait 21 years to cover the buying price. The margin of safety rises up high by 85 and 93 percent in 2011 and ttm. Meaning the price was really cheap, therefore, I recommend a BUY in the stock of Stamps.com (STMP). The balance sheet allows us to see how much a company owes (liabilities)and how much it owns (assets). To keep things in balance between assets and liabilities, we have retained earnings (equity). I evaluated the following key indicator like financial liquidity, leverage, among who had majority control and asset management. Financial liquidity is to determine the ability to pay short-term debt accounts payable that can be converted quickly to cash. Commonly used liquidity ratios include the current ratio, working capital ratio, and net working capital. The current ratio is an indicator of a company’s short-term liquidity; which divides current assets by current liabilities. In addition, the working capital ratio is used as a barometer to measure a company’s over health and liquidity; which is current assets less current liabilities divided by total assets. Networking capital indicates the ratio or percentage of working capital against total assets. Financial liquidity ideal results were equivalent to 1 or 100 percent or more. 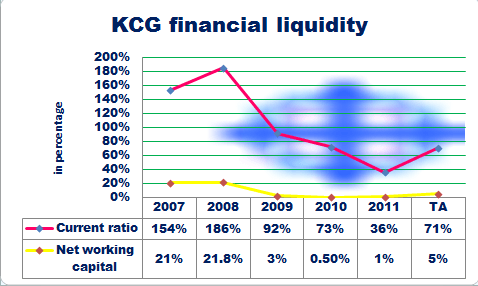 KCG based on the graph had only a total average of 71 percent availability over their current liabilities. In other words, in every $1 of short-term debt, they had available assets of net working capital was declining, it was down to 20 percent based on 2008 results. It had an average of 5 percent means still they were are unable to meet the short-term debt. Leverage is the amount of debt used to finance a firm’s assets. A firm with significantly more debt than equity is considered to be highly leveraged. It is composed of debt ratio, debt to equity and solvency. The debt ratio is to determine how many total assets financed by borrowing funds, through the results of a current asset over current liabilities. Further, debt to equity ratio is the ratio of total shareholders’ equity financed by borrowing funds, from the result of total liabilities over the result of total stockholders’ equity. Furthermore, the solvency ratio measures a company’s ability to meet long-term obligations. Through the result of income after tax add the depreciation and divide to the result of current and long-term liabilities. KCG leverage is too high in terms of the short term. The company finance from borrowed funds was equivalent to $.68 for every $1 of debt. Based on equity, it had an average of 213 percent financed by borrowed funds. It means that in every $1 of equity it was financed two times and it was too high. The ideal solvency result is 20 percent. In evaluating, it is also important to consider who is in majority control of the company. To determine, it includes control from current liabilities to total assets which to identify how much will be claimed by the creditor against total assets of the company. On the other hand, long-term debt to total assets is to make out how much claim has the banks or the bondholder against its total assets. Then, stockholders’ equity to total assets is to know how much the owner can claim in its total assets. Let us see the results for Knight Capital Group Inc.
From the above results; if we based on their total five years of operation; the majority in control was the creditor holder at 33 percent, followed by the stockholder at 32 percent then last to bank/bondholder only at 6 percent. Though from the first three years, it was the stockholders it went down to 20 percent in 2011 compared to the creditor which rose up to 43 percent. Asset management is composed of the following: total asset turnover, receivable turnover ratio, and payable ratio. When we speak of total asset turnover, it tells us the number of times that the assets turn per period, from the results of revenue over current assets. While receivable turnover ratio measures the number of days that companies collect its receivable or convert it into cash by using the result of outstanding receivable over its revenue for the period multiplied by 365 days. Then, the payable turnover ratio is to determine the number of days that the company pays its obligation to its suppliers from the outstanding accounts payable over its total cost of revenue multiplied by 365 days. Based on the table above, KCG ’s five years of operation it showed that the company had a minimum of 167 days to convert their sales into cash. While in the total five years of operation, their minimum of the number of days to pay to its supplier were 529 days. The income statement is the bottom line result of the business for the period after deducting all the direct cost associated with its revenue and the operating expenses like admin and maintenance cost. Then, we can determine the net margins. 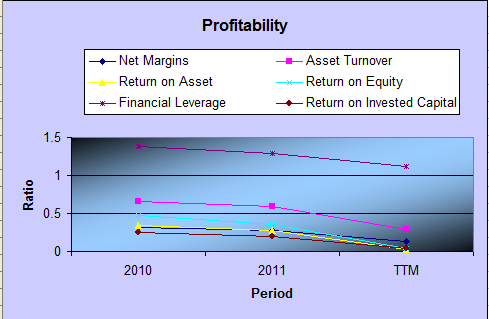 Below are the results, in terms of their profitability, revenue, expenses and margin report for Knight Capital Group Inc.
Profitability is a key measure for the business success; its composition of net margin ratio which defines as the net results after deducting all the expenses, from net income over revenue for the period. Asset turnover measures effectiveness how their assets easily convert to sales; through revenue over the total asset. Return on assets or ROA tells us how much profit the company generated for each dollar of total assets by the result of net income over a total asset. On the other hand, return on equity (ROE), using DuPont, measures the return of such profit percent for every dollar of equity. It can be determined using the result of the net profit margin multiplied by asset turnover. The financial structure ratio is the specific mixture of long–term debt and equity that a company uses to finance its operations. Further, the tax efficiency ratio measures how much profit left after deducting the income tax. It can be determined using the result of net income over profit before tax. Did Knight Capital Group Inc. become profitable? 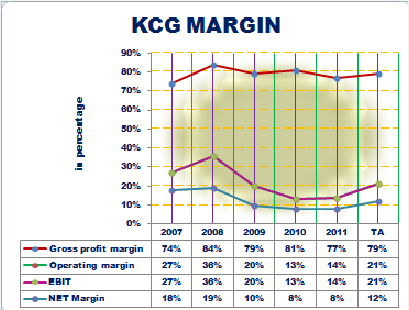 The graph showed that KCG profitability within five years was in the positive result. It had a high net margin result in 2008 at 19 percent and went down from 2009 to 2011 to 8 percent a total of $.12 generated per $1 of the sale. ROE had $0.03 generated in every $1 sale. Revenue is the source of income received from its normal business activities, usually from the sale of goods and services to customers. And gross profit is an income after deducting the associated cost directly from goods or services. In addition, operating income is the result after considering its operations and general expenses of the company. Moreover, income before tax is an income after deducting the taxes. The revenue data and its graph imply that it was progressive except in 2010 which slow down by 1 percent. And the gross profit went continuously upward. In addition, the income before tax shows a declining trend from 2009 at 122 percent. However, recovered in 2011 by 20 percent. How did the expenses affect their margin? 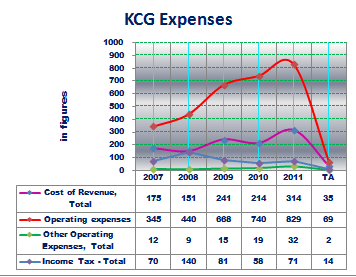 KCG expenses graph and table tell us that they have high expenses incurred in operating compared to the cost of revenue. This is no doubt since they are equity market makers and institutional brokerages. In other terms, they have lots of expenses probably in salaries and involved with research. Thus the business nature itself could define their expenses. The increase in operating expenses is not worrisome since the revenue result could justify and it was effective. It also showed that the percentage of operating expenses really affects the net margin. The Margin determines how much can be generated in every $1 of the sale. It is composed of a gross profit margin. Further, the operating margin denotes how much percentage left after deducting the operating expenses. Furthermore, earnings before income tax or simply EBIT is the result of income before taxes. The net margin ratio or the equivalent percentage after applying all the expenses for that period. Gross profit had generated a profit of $.79 over $1 on sale. And the operating margin and EBIT had the same result. The two both declined from 36 percent in 2009 and in 2010 down to 14 percent have an average $.21 generated in every $1. On the other hand, the net margin had a total average return at $.12 in every $1. It tells us they had a profitable result though in a declining trend. Cash flow is a statement that helps in determining if the company has available cash for the operation alone. In other words, if they have a good free cash flow to maintain the maintenance of its resources. and if they had an excess of funds to refinance or cash available for business expansion. 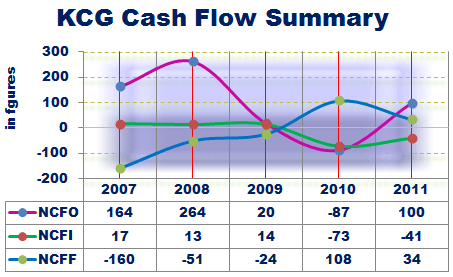 The cash flow summary of KCG was in sideways. The cash flow from 2007 and 2008 was progressive with an equivalent of 36 and 57 percent. And then went down in 2009 and 2010 by 4 and -19 percent and went up by 22 percent in 2011. It tells us the management is recovering and efficient. 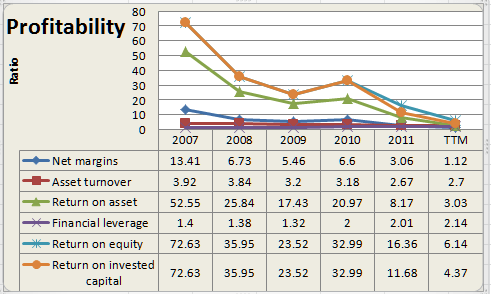 In addition, the cash flow from investing in 2007 to 2009 had cash due to sales of mature investment. Moreover, an outflow resulted due to the high cash used in the purchasing of PPE that purchases in investment. Financing had a reversed transaction from investing which from 2007 to 2009; it had an outflow of cash used for another financing. While, from 2010 and 2011 it had an inflow of cash due to long-term debt issued at 337 percent and change in short-term borrowing at 288 percent, respectively. 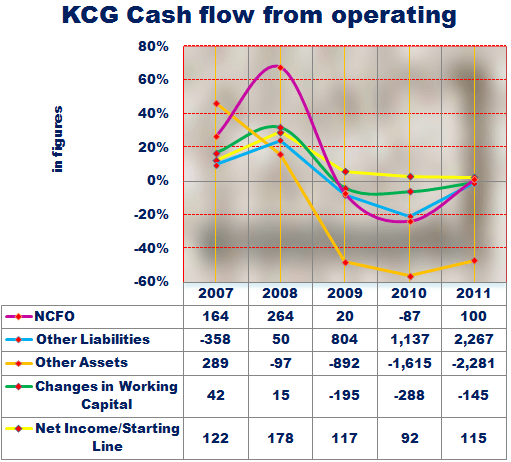 Net operating cash flow had a negative result in 2010 due to the net income represented at 15 percent. Other asset and liabilities had a decreased of 84 percent. And also the increase of payables at 89 percent over their five years of operations. Cash flow from operating ratio of sales measures how much cash generated from its revenue for the period. And the operating cash flow ratio; by using the result of operating cash flow from operating over current liabilities; measures how much cash left after considering short debt. In addition, free cash ratios help us conclude if the company will grow in the future. Through the result of operating cash flow fewer, dividends paid less capital expenditure over operating cash flow. Capital expenditure ratio measures company sustainability in maintaining their assets by using the result of operating cash flow over capital expenditure for the period. Moreover, the total debt ratio is the result of operating cash flow over total liabilities. This measures the company’s efficiency. Next, the current coverage ratio measures how much cash available after paying all its current debt. 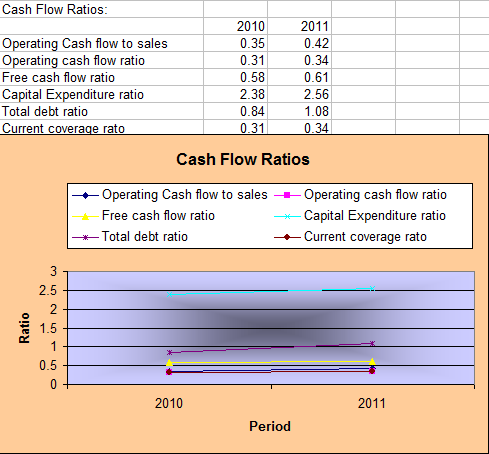 Cash flow ratio results implied that based on the data and the movement showed. The operating cash flow of sales had an average of 11 percent In other words, $.11 generated in every $1 of sales. The operating cash flow ratio and the current coverage ratio was 269 percent in 2008. And went down to -26 percent in 2010; resulted in 80 percent average or $.80 cash available for every $1 of debt. 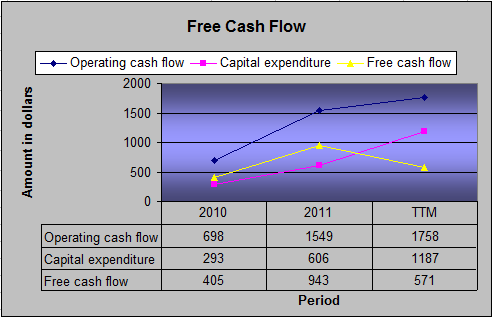 Free cash flow was not stable, fell down during 2009 due to fixed asset exceeded by -110 percent or $.57 in every $1. Capital expenditure was sufficient even though the company suffered -177 percent in 2010. It resulted in an average of 389 percent or $3.89 available cash over $1 of CAPEX maintenance. In addition, total debt ratio; through positive; was not sufficient with an average of $.09 for every $1 of debt. Knight Capital Group Inc (KCG) balance sheet allows us to see how much a company owes (liabilities)and how much it owns (assets). To keep things in balance between assets and liabilities, we have retained earnings (equity). 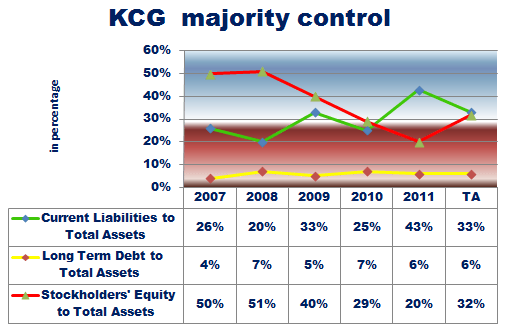 In KCG, I evaluated the following key indicator like financial liquidity, leverage, among who had majority control and asset management. Financial liquidity is to determine the ability to pay a short-term debt such as cash, accounts payable, inventory and other assets that can be converted quickly to cash. 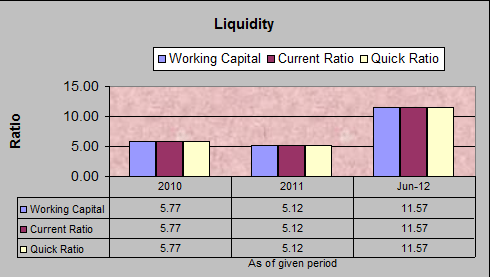 Commonly used liquidity ratios include current ratio, working capital ratio, and net working capital. The current ratio is an indicator of a company’s short-term liquidity; which divides current assets by current liabilities. The working capital ratio is used as a barometer to measure a company’s over health and liquidity; which is current assets less current liabilities divided by total assets. Net working capital indicates the ratio or percentage of working capital against total assets. Financial liquidity ideal results were equivalent to 1 or 100 percent or more. Knight Capital Group Inc. based on the graph, had only a total average of 71 percent availability over their current liabilities or in every $1 of short-term debt, they had available assets of $71 only. The net working capital was declining, it was down to 20 percent based on 2008 results; It had an average of 5 percent means still they were are unable to meet the short-term debt. Leverage is the amount of debt used to finance a firm’s assets. A firm with significantly more debt than equity is considered to be highly leveraged. It is composed of debt ratio, debt to equity and solvency. The debt ratio is to determine how many total assets financed by borrowing funds, through the results of a current asset over current liabilities. Debt to equity ratio is the ratio of total shareholders’ equity financed by borrowing funds, from the result of total liabilities over the result of total stockholders’ equity. The solvency ratio measures a company’s ability to meet long-term obligations. Through the result of income after tax add the depreciation and divide to the result of current and long-term liabilities. 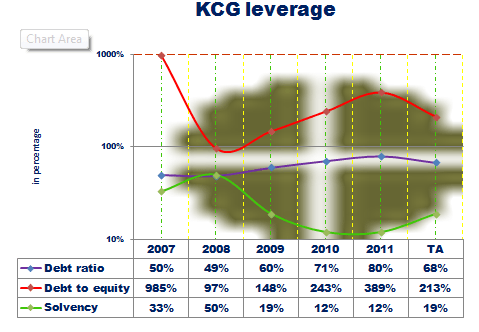 KCG leverage is too high in terms of short term. The company finance from borrowed funds was equivalent to $.68 for every $1 of debt. Based on equity, it had an average of 213 percent financed by borrowed funds. It means that in every $1 of equity it was financed two times and it was too high. The ideal solvency result is 20 percent. Here in Knight Capital Group, their total was 19 percent. What does it mean? It says that they need to wait and guard since the trend declined wherein it was 50 percent in 2008 then went down to 12 percent in 2010 and the same result in 2011. In evaluating, it is also important to consider who is in majority control of the company. To determine, it includes control from current liabilities to total assets which to identify how much will be claimed by the creditor against total assets of the company. On the other hand, long-term debt to total assets is to make out how much claim has the banks or the bond holder against its total assets. Then, stockholders’ equity to total assets is to know how much the owner can claim in its total assets. Let us see the results for Knight Capital Group Inc.
Profitability is a key measure for the business success; its composition of net margin ratio which defines as the net results after deducting all the expenses, from net income over revenue for the period. Asset turnover measures effectiveness how their assets easily convert to sales; through revenue over the total asset. Return on assets or ROA tells us how much profit the company generated for each dollar of total assets by the result of net income over a total asset. Return on equity (ROE), using DuPont, measures the return of such profit percent for every dollar of equity. It can be determined using the result of net profit margin multiplied by asset turnover. The financial structure ratio is the specific mixture of long–term debt and equity that a company uses to finance its operations; it can be obtained from asset over stockholders’ equity for the period. Then the tax efficiency ratio measures how much profit left after deducting the income tax. It can be determined using the result of net income over profit before tax. Did Knight Capital Group Inc. become profitable? 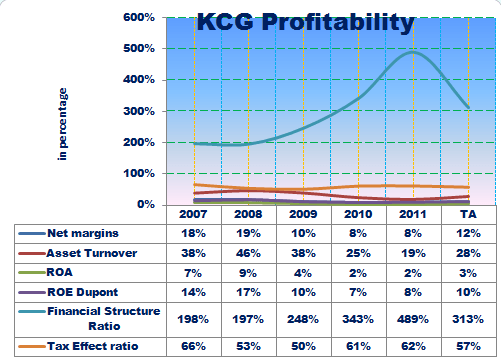 The graph showed that KCG profitability within five years was in the positive result. It had a high net margin result in 2008 at 19 percent and started going down from 2009 to 2011 to 8 percent which had a total of $.12 generated per $1 of the sale. It had a slow return in total from ROA; only $. 03 will be generated in every $1 sale of its assets. Revenue is the source of income received from its normal business activities, usually from the sale of goods and services to customers. Gross profit is an income after deducting the associated cost directly from goods or services. Operating income is the result after considering its operations and general expenses of the company. Income before tax is an income after deducting the taxes than the bottom line or the result for the period is called net income. The revenue data and its graph imply that it was progressive except in 2010 slow down by 1 percent. The gross profit went continuously upward. The operating and income before tax had the same result which shows declining from 2009 to 122 percent and recovered in 2011 by 20 percent so the trend also in net income was affected the same movement from EBIT. Knight Capital Group Inc expenses are composed of the cost of revenue which defines the direct cost related to the selling of goods or rendering services. Operating expenses are an expense incurred in performing or selling of goods like the salaries and wages. Other operating expenses are expenses incurred from the borrowing of funds like interest expense. Income tax is the taxes incurred by the revenue. How did the expenses affect their margin? KCG expenses graph and table tell us that they have high expenses incurred in operating compared to the cost of revenue. This is no doubt since they are equity market makers and institutional brokerages, meaning they have lots of expenses probably in salaries and involved with research, thus the business nature itself could define their expenses. The increase in operating expenses is not worrisome since the revenue result could justify and it was effective. It also showed that the percentage of operating expenses really affects the net margin. The Margin is a key indicator and helps us determine how much can be generated in every $1 of the sale. It is composed of gross profit margin that measures how much profit will be left after considering its direct cost. To know the ratio, we use the gross profit amount which is the result of revenue less the cost of revenue then divide it into revenue. The operating margin denotes how much percentage left after deducting the operating expenses. Earnings before income tax or simply EBIT is the result of income before taxes applied then lastly is the net margin ratio or the equivalent percentage after applying all the expenses for that period. KCG margin result in gross profit was smoothly in sideways or in total average they had generated a profit of $.79 over $1 on sale. The operating margin and EBIT had the same result. The two both declined from 36 percent in 2009 and in 2010 down to 14 percent having average $.21 generated in every $1. The net margin had a total average return at $.12 in every $1. It tells us they had a profitable result though in a declining trend. Cash flow is a statement that helps in determining if the company has available cash for the operation alone; or if they have a good free cash flow to maintain the maintenance of its resources; or if they had an excess of funds to refinance or cash available for business expansion. It is composed of net cash flow from operating which is a net of cash available left after deducting all the payments. For direct cost and operating expenses and directly related to the operation. While net cash flow from investing is net cash used or provided from investing activity. Like in purchasing or reduction of property, plant, and equipment (PPE). Then the net cash flow from financing is a net of cash used or provided for financing activity. Like dividend paid and repayment of long-term debt. 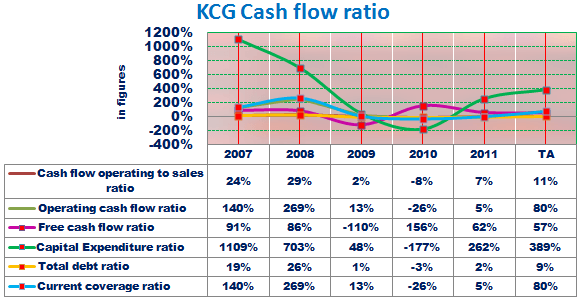 The cash flow summary of KCG was in sideways. The cash flow from 2007 and 2008 was progressive with an equivalent of 36 and 57 percent, then went down in 2009 and 2010 by 4 and -19 percent and went up by 22 percent in 2011. It tells us the management is recovering and efficient. The cash flow from investing from 2007 to 2009 had a cash inflow due to sales of mature investment compared to the acquisition or purchased of PPE but for 2010 and 2011, the opposite was indicated. An outflow resulted due to high cash used in the purchasing of PPE that purchases in investment. Financing had a reversed transaction from investing which from 2007 to 2009; it had an outflow of cash used for another financing. While from 2010 and 2011 it had an inflow of cash due to long-term debt issued at 337 percent and change in short-term borrowing at 288 percent, respectively. Net cash flow from operations is a result of cash net available after considering its cost and expenses related to the operation. Further, it can be expressed using income method; from net income which widely known as the bottom line of every business then add back the non-related cash items like depreciation any difference from working capital like account payable and accounts receivables. The net operating cash flow had a negative result in 2010 due to the net income represented at 15 percent. The decrease of other asset and liabilities by 84 percent. And also the increase of payables at 89 percent over their five years of operations. Cash flow from operating ratio of sales measures how much cash generated from its revenue for the period. It can be determined using the data of net cash flow from operating over the revenue. Operating cash flow ratio; by using the result of operating cash flow from operating over current liabilities; measures how much cash left after considering short debt. Free cash ratios help us conclude if the company will grow in the future. Capital expenditure ratio measures company sustainability in maintaining their assets. The total debt ratio is the result of operating cash flow over total liabilities. This measures the company’s efficiency. Current coverage ratio measures how much cash available after paying all its current debt. It can be determined through cash flow from operating. Operating cash flow of sales was in sideways and had only an average of 11 percent or $.11 generated in every $1 of sales. The operating cash flow ratio and current coverage ratio deteriorated by 269 percent in 2008. Then went down to -26 percent in 2010. It resulted in 80 percent average or $.80 cash available for every $1 of debt. Moreover, free cash flow is not stable, down during 2009 due to fixed asset exceeded by -110 percent or equivalent to $.57 in every $1. 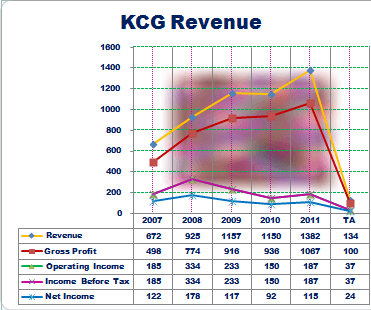 The capital expenditure of KCG was sufficient even though the company suffered -177 percent in 2010. It resulted in an average of 389 percent or $3.89 available cash over $1 of CAPEX maintenance. The total debt ratio; through positive; was not sufficient with an average of $.09 for every $1 of debt. Tuesday Morning Corporation (TUES) pricing model is prepared in a very simple and easy way to value a company, it adopts the investment style of the Father of Value Investing Benjamin Graham. The essence is that any investment should be purchased at a discount, meaning the true value should be more than the market value. Graham believed in fundamental analysis and was looking for companies with a sound balance sheet and with little debt. The basis for this valuation is the company’s five years of historical financial records, the balance sheet, income statement, and cash flow statement. We calculated first the enterprise value as our first step. We believed this is important because it measures the total value of the company. The table above you will notice that the enterprise value has an erratic movement of up and down from 2007 to 2011 and the trailing twelve months at average 9 percent. The total debt (net of cash) was -5 percent average, meaning cash was greater than total debt. The market cap was trending erratically at a rate of 17 percent average. The enterprise value, as we can see in the table, had an inconsistent movement of up and down from 2007 to 2011 and the trailing twelve months (TTM) at an average 9 percent. The total debt (net of cash)was -5 percent average, meaning cash was greater than total debt. The market capitalization (market cap) was trending erratically at a rate of 17 percent average. From 2009 to 2012 TTM, the company has no short and long term debts. Usually, companies with low debt, high cash of higher quality are more likely to survive an economic downturn and problems and have the possibility of rewarding the stockholders. The table shows that market price and enterprise value were greater than the computed 66 percent of net current asset value during 2007, 2010, 2011 and the TTM. Meaning, the price is trading at an overvalued price. While in 2008 and 2009, the enterprise value per share was lesser than the computed 66 percent of the NCAV by -38 and 6percent, respectively. This means the price was trading undervalued. Another stock test by Graham is by using market capitalization and dividing it to NCAV. If the result does not exceed the ratio of 1.2, then the stock passes the test for buying. The margin of safety is used to identify the difference between company value and price. Value investing is based on the assumption that two values are attached to all companies – the market price and the company’s business value or true value. Graham called it the intrinsic value. The difference between the two values is called the margin of safety. According to Graham, the investor should invest only if the market price is trading at a discount to its intrinsic value. Value investing is buying with a sufficient margin of safety. Graham considers buying when the market price is considerably lower than the intrinsic or real value, a minimum of 40 to 50 percent below. The enterprise value is used because I believed it is a much more accurate measure of the company’s true market value than market capitalization. The table above showed that in 2007, 2009, 2010 and 2012, trailing twelve months, there was no margin of safety because the price was higher than the intrinsic value. It indicated that the price was expensive during these periods. While in 2008 and 2011 there was the margin of safety at 78 and 18 percent, respectively, meaning the price was cheap during these periods. The margin of safety represents a 16 percent average from 2007 to 2012, TTM. Above calculation showed that TUES has no payout ratio. This means the company is not paying any dividends from 2007 to 2012 trailing twelve months. So, the growth that was used in the calculation of intrinsic value was also the return on equity. The ROE has an erratic movement. Moreover, ROE is an indicator of company’s profitability by measuring how much profit the company generates with the money invested by common stock owners. In addition, it is also known as return on net worth. Return on equity shows how many dollars of earnings result from each dollar of equity. I prefer to consider using the average ROE rather than the relative ROE. The table below will show us the differences between the two ratios. The table showed that using the average ratio will produce a lesser ratio/percentage than by using the relative ratio. The margin of safety represents 16 percent and 15 percent average using the relative and average ratio, respectively. The intrinsic value (IV) showed erratic movement, while the enterprise value (EV) was stable between $2 and $4. And in 2008, the distance of intrinsic value with the price is at 78 percent and that is the margin of safety. This is the excess of the intrinsic value over the price. It means the price is trading below the true value of the stocks. This is the way the margin of safety works. In 2009, the intrinsic value line was below the price, meaning the stocks are trading above the true value of the stocks, same as in 2010 and the trailing twelve months, the price was expensive. This method will determine whether the stocks are undervalued or overvalued. By multiplying the Price to Earnings (P/E) ratio with the company’s relative Earning per Share (EPS). And then comparing it to the enterprise value per share. We can determine the status of the stock price. Using the P/E*EPS ratio valuation in determining the undervalued stocks, it showed that the enterprise value per share was undervalued from 2007 to 2012 ttm but except 2009. Further, the enterprise value per share was lesser than the P/E*EPS result by 43 percent average. The price was trading at an undervalued price. Moreover, price to earnings ratio indicates the multiple that an investor is willing to pay for a dollar of a company’s earning. It shows the number of times that a stock price is trading relative to its earning. While EPS serves as an indicator of a company’s profitability. Company’s profit is allocated to its outstanding shares of common stocks. It is the major component used to calculate the Price to Earnings (P/E) valuation ratio. The use of EV/EPS ratio is dividing the market price by its projected earnings per share (EPS). By dividing the two ratios, the calculated result produces the price and the difference is the earnings. This separates the price and earnings from the enterprise value. The earnings have a greater percentage than that of the price. In addition, the price to earnings (P/E) represents a 17 percent average. And the earning per share (EPS) represents 83 percent average. This is a number of earnings that the investors are willing to pay for every dollar of the buying price. The Enterprise Value/EBITDA indicate the number of times to cover up for the costs of buying the whole enterprise. In the case of Tues, the results show an average of 15 years or 15 times for the earnings of the company to cover the buying price. In the table, it showed that in 2011 and the trailing twelve months, it would take only 2 years and 1 year respectively to cover the purchase price inclusive of total debt (net of cash). Since, enterprise value factors debt and cash, the enterprise value decreases because the cash increased by percent 300, -21 and 105 in 2010 to the trailing twelve months. Further, the EBITDA increased by $16M in 2011 and $3M in the trailing twelve months, therefore, the enterprise value decreased. In valuing the stocks of Tuesday Morning Corporation (TUES), after performing the Benjamin Graham’s stock test, tells us that in net current asset value per share (NCAVPS) valuation that the stocks did not pass the test. Because the stock is trading above the liquidation value of the company. While the market value/net current asset valuation (MV/NCAV) shows that the stock of Tuesday Morning Corporation passes the test except in 2010. For the reason, it did not exceed the 1.2 ratios. The margin of safety approach tells us that there was a margin of safety during 2008 and 2011 at 78 and 18 percent, respectively. Intrinsic value represents 84 percent average of the price and the margin of safety was -16 percent in average from its 5 years of operation. While using the average return on equity in calculating the sustainable growth rate, the average margin of safety was 15 percent. On the other hand, using the relative method shows that the stock price was undervalued from 2010 to 2012. Because the price was lower than the result. Using the average price to an earning ratio in calculating the P/E*EPS valuation, it gives us a higher result. The result was 12 average against 8 average in relative P/E. And the price to earning was 74 in average P/E against 61 in relative P/E. While the enterprise value/earning per share (EV/EPS) indicate that the price (P/E) represents a 17 percent average. And the earnings (EPS) represents 83 percent average. Considering the percentage of the price to earnings in which price represents only 20 percent of the earnings. I might say that the price was trading undervalued. Further, the EV/EBITDA indicates an average of 15 years to cover the costs of buying. In other terms, it will take 15 times the earnings to cover the costs of buying. However, in 2011 it shows only 2 years to cover the costs of buying the entire business inclusive of total debt, net of cash. The stock price of TUES was undervalued using the relative valuation method. While the MV/NCAV valuation tells us that the stock of TUES passes the stock test of Benjamin Graham. Because it does not exceed the 1.2 ratios. The company’s sustainable growth rate and the annual growth rate at 2.95 average and 15.0 average, respectively, were both favorable. So, I recommend a BUY in the stock of Tuesday Morning Corporation (TUES). This model is prepared in a very simple and easy way to value a company, it adopts the investment style of the Father of Value Investing Benjamin Graham. The essence is that any investment should be purchased at a discount, meaning the true value should be more than the market value. Graham believed in fundamental analysis and was looking for companies with a sound balance sheet and with little debt. The basis for this valuation is the company’s five years historical financial records, the balance sheet, income statement and cash flow statement. We calculated first the enterprise value as our first step. We believed this is important because it measures the total value of the company. I would like to consider using the average ROE rather than the relative ROE. The table below will show us the differences between the two ratios. For TUES, the above table showed that using the average ratio, it will produce a lesser ratio/percentage than by using the relative ratio. The margin of safety represents 16 percent and 15 percent average using the relative and average ratio, respectively. The intrinsic value (IV) showed erratic movement, while the enterprise value (EV) was stable between $2 and $4. In 2008, the distance of intrinsic value with the price is at 78 percent and that is the margin of safety. This is the excess of the intrinsic value over the price. It means the price is trading below the true value of the stocks. This is the way the margin of safety works. In 2009, the intrinsic value line was below the price, meaning the stocks are trading above the true value of the stocks, same as in 2010 and the trailing twelve months, the price was expensive. Using the P/E*EPS ratio valuation in determining the undervalued stocks, the result of the calculation showed that the enterprise value per share was undervalued in 2007 to 2012, trailing twelve months, except in 2009. The enterprise value per share was lesser than the P/E*EPS result by 43 percent average. The price was trading at an undervalued price. Price to earnings ratio indicates the multiple that an investor is willing to pay for a dollar of a company’s earning. It shows the number of times that a stock price is trading relative to its earning. While EPS serves as an indicator of a company’s profitability. The table above shows that the price and earnings were separated from the enterprise value. The earnings have a greater percentage than that of the price. The price to earnings (P/E) was 17 percent average and the earning per share (EPS) represents 83 percent average. The price of TUES was undervalued. This is a number of earnings that the investors are willing to pay for every dollar of the buying price. The enterprise value/EBITDA indicate the number of times to cover up for the costs of buying the whole enterprise. In the case of Tues, the results show an average of 15 years or 15 times for the earnings of the company to cover the buying price. In the table, it showed that in 2011 and the trailing twelve months, it would take only 2 years and 1 year respectively to cover the purchase price inclusive of total debt (net of cash). Since, enterprise value factors debt and cash, the enterprise value decreases because the cash increased by percent 300, -21 and 105 in 2010 to the trailing twelve months. The EBITDA increased by $16M in 2011 and $3M in the trailing twelve months, therefore, the enterprise value decreased. In valuing the stocks of TUES, after performing the Benjamin Graham’s stock test, tells us that in net current asset value per share (NCAVPS) valuation, the stocks did not pass the test because the stock is trading above the liquidation value of the company. While the market value/net current asset valuation (MV/NCAV) valuation it shows that the stock of TUES the test except in 2010 because it did not exceed the 1.2 ratios. On the other hand, the margin of safety approach tells us that there was a margin of safety during 2008 and 2011 was 78 and 18 percent, respectively. Intrinsic value represents 84 percent average of the price and the margin of safety was -16 percent on average from its 5 years of operation. While using the average return on equity in calculating the sustainable growth rate, the average margin of safety was 15 percent. On the other hand, the price was undervalued in the P/E*EPS valuation. Because the price was lower than the result. Using the average price to an earning ratio in calculating the P/E*EPS valuation, it gives us a higher result. The result was 12 average against 8 average in relative P/E. And the price to earning was 74 in average P/E against 61 in relative P/E. The overall result for this valuation was, the stock price was undervalued. While the enterprise value/earning per share (EV/EPS) valuation indicate that the price (P/E) represents a 17 percent average and the earnings (EPS) represents 83 percent average. Further, EV/EBITDA indicates an average of 15 years to cover the costs of buying or 15 times the earnings to cover the costs of buying. However, in 2011, it shows only 2 years to cover the costs of buying the entire business inclusive of total debt. The reason for this is, TUES has no debt but greater cash that makes the enterprise value to decrease, thus resulting in lesser years of waiting. The relative valuation method indicates that the price was undervalued from 2007 to 2012 ttm. The MV/NCAV valuation tells us that the stock of TUES passes the stock test of Graham. Because it does not exceed the 1.2 ratios. The company’s sustainable growth rate and the annual growth rate at 2.95 average and 15.0 average, respectively, were both favorable. So, I recommend a BUY in the stock of Tuesday Morning Corporation (TUES). Almost Family Inc. (AFAM) stocks average daily volume was 56,573 shares over the previous 30 days, but have experienced an unusually high trading volume of 522,695,481 shares last July 26, 2012. The company is getting more efficient which is a great thing for the long term. Owning a stock to this company in the long run, can we live with that? Let’s find out. The model we used for this investment valuation report adopted the investment style of Benjamin Graham. The philosophy that Graham has is to offer smart investors an opportunity to buy wisely when prices fall sharply and to sell wisely when it advances a great deal. He believed in thorough analysis, which we call fundamental analysis. The basis for this valuation is the company’s five years of historical financial records. The enterprise value is the initial step in this valuation. I also applied the relative valuation method by using Price to Earnings (P/E), Earning per Share (EPS), Enterprise Value (EV) and Earning Before Interest + Tax + Depreciation + Amortization (EBITDA). The concept of enterprise value is to calculate what it would cost to purchase an entire business. Enterprise value (EV) It factors liabilities and cash. In other words, enterprise value measures the value of the productive assets that are used in producing its product or services. The market capitalization is the entire value of the company in the stock exchange. It represents the price of equity and long-term debt. Cash and cash equivalents include short-term investment. Enterprise value is the theoretical takeover price. In the event of a buyout, an acquirer would have to take on the company’s debt but would pocket its cash. Enterprise value differs significantly from market capitalization, and many consider it to be a more accurate representation of a firm’s value. The value of a firm’s debt would need to be paid by the buyer when taking over a company thus, enterprise value provides a much more accurate takeover valuation because it includes debt in its value calculation. The enterprise value of AFAM is lesser than the market value since it factors debt and cash. Its cash and cash equivalent represents 10 percent average and its total debt was 4 percent average. The EV decreases from 2008 to 2011 but showed an increased in the trailing twelve months at 38 percent, so as to market capitalization at 32 percent. Buying the entire company is paying 100 percent of the company’s equity at $168M. The concept of this method is to identify stocks trading at a discount to the company’s net current asset value per share, specifically two-thirds or 66 percent of net current asset value. This method is one of the oldest documented stock selection methodologies, dating back in the 1930s. Laid below is the formula used to get the results for Almost Family Inc.
As to the results of net current asset value per share valuation, the stock of AFAM was overvalued from 2007 to 2012 trailing twelve months. The 66 percent result was lesser than the market value, thus, the stock is trading above the liquidation value. The market value was over by 89 percent against 66 percent or two-thirds of net current asset value. Therefore, the stock did not pass the stock test of Graham. The stock of AFAM was undervalued from 2009 to 2012 trailing twelve months because the result was more than 1.2 ratio, therefore, it did not pass the stock test of Benjamin Graham. Let us have a quick overview of Graham’s thinking on this matter. Graham considers only the liquid assets of the company in determining the stock price trading at a discount price. If the result of the valuation is above the ratio, he would not buy. If the price is equal or below the result, then he would buy, he considers the stock selling at a discount. The margin of safety requires knowing when the buying price is low in absolute terms, rather than merely relative to the market as a whole. This formula is used to identify the difference between company value and price. Value investing is based on the assumption that two values are attached to all companies – the market price and the company’s business value or true value. Graham called it the intrinsic value. The difference between the two values is called the margin of safety. Value investing is buying with a sufficient margin of safety. Graham considers buying when the market price is considerably lower than the intrinsic or real value, a minimum of 40 percent to 50 percent below. 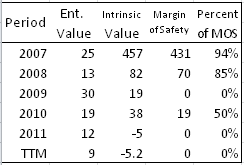 The margin of safety represented 73 percent average of the intrinsic value while the intrinsic value was $106.5 average. The price was undervalued from 2007 to 2012 trailing twelve months and the margin of safety was more than the 40 percent requirement of Benjamin Graham in purchasing stock. 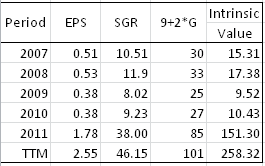 EPS stands for the company’s last 12-month earnings per share; G: the company’s long- term (five years) sustainable growth estimate; 9 : the constant represents the appropriate P-E ratio for a no-growth company as proposed by Graham (Graham proposed an 8.5, but we changed it to 9), and 2: the average yield of high-grade corporate bonds. 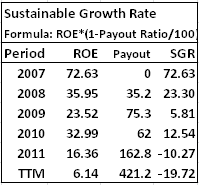 In the calculation of sustainable growth rate (SGR), I have used the return on equity (ROE) and the payout ratio. 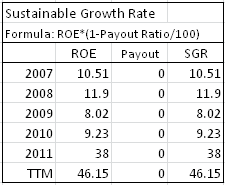 Since there was no payout ratio, the result for SGR is the same as ROE. There is no payout ratio because the company is not paying dividends from 2007 to 2011. Using the average ratio, it shows that the result was higher than that of the relative ratio. By using the average ratio, we consider the growth of the company from year over year. This shows a fair valuation for Almost Family Inc. This valuation will determine whether the stocks are undervalued or overvalued by multiplying the price to earnings (P/E) ratio with the company’s relative earning per share (EPS). Then comparing it to the enterprise value per share. With this, we can determine the status of the stock price. The average price to earnings ratio produced a greater result as we see in the table. The result must be compared to enterprise value per share. If the enterprise value is lesser than the result, then stocks are undervalued. On the other hand, if the enterprise value is greater than the result, it means that the stock is overvalued. In the case of AFAM, the stock is trading at an undervalued price. The purpose of this ratio is to separate price and earnings in enterprise value. By dividing the enterprise value to projected earnings (EPS), the result represents the price (P/E) and the difference represents the earnings (EPS). If the analysts think that the appropriate ratio is greater or lower than the result, then the stock is either over or undervalued. The enterprise value was separated to price and earnings wherein the price represents 42% percent and the earnings are 58 percent. The result indicates that the stock is trading at an undervalued price. The investor would know how much dollar he is paying for the price and how much for the earnings. This is the price that an investor is willing to pay. It also gives someone an idea if the price is expensive or cheap. This metric is used in estimating business valuation. It compares the value of the company inclusive of debt and other liabilities to the actual cash earnings. This metric is useful for analyzing and comparing profitability between. The EV/EBITDA tells us that buying the entire AFAM, an investor will have to wait 7 years average to cover the costs of buying. In other words, it will take 7 times the earnings to cover the purchase price inclusive of the total debt. As an overview, since the margin of safety is high at 82 percent using the average return on equity. I recommend a BUY on the stock of Almost Family, Inc (AFAM). For more information, click the following on company research, investment guide, and value investing guide.